Public Announcements, Requests for Proposals, Job Opportunities directly related to the geothermal community. The State of Hawaii Department of Land and Natural Resources is recruiting for a Mineral Resources Specialist to be part of the Mineral Resources Section which performs geothermal resource management functions. This position is responsible for serving as planner-in-charge of departmental geothermal resources management activities by conducting studies, performing analyses, preparing plans and coordinating activities related to the proper management of geothermal resources and development of geothermal energy in Hawaii. Performs other duties as assigned. Ormat Technologies is seeking to hire a new Production Engineer. From Ormat: “This position is responsible for conducting engineering studies and overseeing the implementation of solutions to optimize Ormat’s geothermal resource production, injection and support equipment.” Essential functions, responsibilities and requirements are available at Ormat’s Web site at http://www.ormat.com/company/careers/production-engineer. Solicitations are open for the Title XVII Innovative Clean Energy Projects (Title XVII) loan program, and LPO is currently accepting applications. A remaining loan and loan guarantee authority of over $40 billion is authorized to finance innovative clean energy projects and advanced technology vehicles manufacturing, through the U.S. Department of Energy. Eligible projects must utilize a new or significantly improved technology, avoid, reduce or sequester greenhouse gases, be located in the United States, and have reasonable prospect of repayment. More information at http://www.energy.gov/lpo/open-solicitations. Via DOE — U.S. Department of Energy Secretary Ernest Moniz announced in Octobe 2015 that $1 billion of additional loan guarantee authority, which was announced by President Obama in August, is now available for applicants to the Title XVII program. This follows a 45-day congressional notification period which has now concluded. The new supplemental guidance for the Advanced Fossil Energy Projects solicitation adds $500 million, raising the total loan guarantee authority to $8.5 billion. The new supplemental guidance for the Renewable Energy and Efficient Energy (REEE) Projects solicitation also adds $500 million, raising the total loan guarantee authority to $3 billion, plus an additional amount that can be imputed based on the availability of an appropriation for the credit subsidy cost of such imputed loan guarantee authority. Deadlines for the Advanced Fossil and REEE solicitations extend into 2016. EERE-ORISE/STP-2014-3 ~ The Department of Energy’s EERE Science and Technology Policy (STP) Fellowships will serve as the next step in the educational and professional development of leaders in energy efficiency and renewable energy, providing an opportunity for scientists and engineers with relevant energy technology experience to participate in research, development, demonstration, (RD&D) and analysis projects. Geothermal STP Fellows: Applicants selected as a Geothermal STP Fellow will be a member of the Geothermal Technologies Office (GTO) and carry out activities critical to GTO’s technology mission. The Fellow will participate in technology management within a designated GTO program and provide technical guidance, support, and collaboration to RD&D activities conducted by industry, university, National Lab, and other partners. The Fellow will also assist the GTO and assigned program team to develop and advance the Office’s technology priorities and goals through strategic planning, milestone development, and project execution. In addition, the Fellow will engage with other EERE and DOE Offices and geothermal stakeholders to advance shared technical and policy goals that breakdown technical and non-technical barriers to geothermal deployment in the U.S. The STP Fellowships are for two years. The initial appointment period is one year. For more information, see http://www1.eere.energy.gov/education/stp_fellowships.html. How to Apply: On the Web site http://www1.eere.energy.gov/education/stp_fellowships.html applicants can find the application form, the email to which to submit their applications, and other pertinent information. 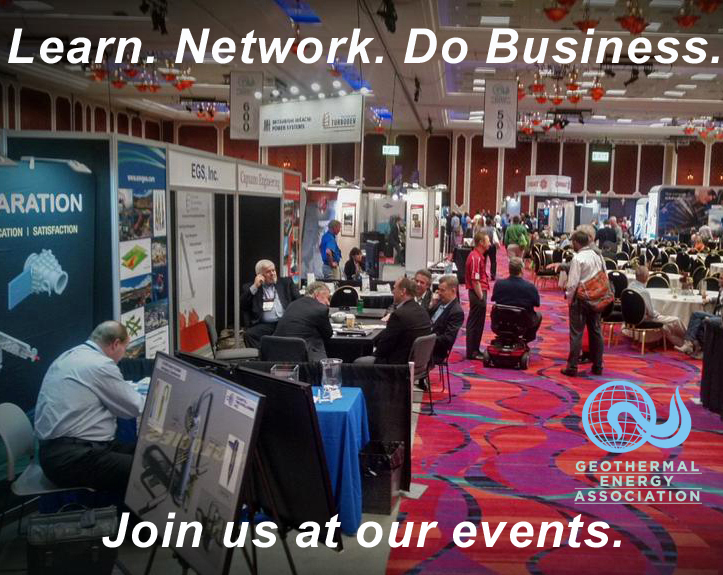 The conference goal is to advance understanding of energy production, helping companies successfully produce clean energy while extending the life of an oil and gas field. SMU invites you to submit an abstract for the poster session or a 15 minute oral presentation. We are also accepting suggestions and abstracts for panel discussions. Submit your 1-2 page abstract to geothermal@smu.edu by February 5, 2016. One of the critical obstacles to the development of geothermal energy projects is the cost and risk associated with geothermal resource exploration, up to and including production drilling. Around the world, a variety of initiatives have been launched by governments, multi-lateral institutions, and donors to reduce this risk and incent private sector development of geothermal resources. This consultancy, funded by the U.S. – East Africa Geothermal Partnership, aims to accelerate the development of geothermal energy resources in East Africa by designing a mechanism to mitigate risks in geothermal development. The consultant will 1) examine existing risk mitigation instruments deployed around the world; 2) identify best practices in de-risking geothermal development through production drilling, and; 3) develop a facility to complement current public financed and managed risk mitigation facilities in East Africa, including those administered by United Nations Environment Programme’s African Rift Geothermal Development Facility (ARGeo) and The African Union Commission’s Geothermal Risk Mitigation Facility (GRMF). The selected consultant will, in close coordination with private sector, geothermal industry associations and government stakeholders, outline the risks in each phase of geothermal development and research global experience in mitigating these risks through donor -funded and/or private sector mechanisms. An example to consider will be the Risk Mitigation model funded by the InterAmerican Development Bank implemented in some countries in Latin America among others. The consultant will then study the existing initiatives in East Africa to reduce geothermal development risk and design a complementary initiative or initiatives to accelerate the development of geothermal energy in the region. The consultant is also expected to facilitate a stake holder dialogue to vet and adopt the recommendation on the proposed initiative(s). Finally, the consultant will develop an implementation and management plan to launch these initiative (s). The U.S.-East Africa Geothermal Partnership (EAGP) is a public-private partnership between the U.S. Agency for International Development (USAID) and the US Geothermal Energy Association (GEA), implemented by the U.S. Energy Association (USEA). It was established in September 2012 to promote the development of geothermal energy projects and increase private sector investments in geothermal in East Africa. It also encourages and facilitates the involvement of the U.S. geothermal industry in the region. EAGP is part of the Power Africa Initiative. One of the the goals of the Initiative is doubling access to power in sub-Saharan Africa in five years. Power Africa uses a wide range of U.S. government tools to support investment in Africa’s energy sector. From policy and regulatory best practices, to pre-feasibility studies and capacity building, to long-term financing, insurance, guarantees, credit enhancements and technical assistance, Power Africa provides coordinated support to help African partners expand their electricity generation capacity and access. With an estimated 15,000 MW of potential geothermal capacity in East Africa – a clean, reliable, baseload power solution – geothermal energy is critical to East Africa’s economic development especially as a base-load power source. The consultant’s main objective of this task is to conduct a background assessment of current and past risk mitigation mechanisms for geothermal development, identify unique factors contributing to risk in the East African market, examine existing risk mitigation mechanisms deployed in East Africa; review other risk mitigation facilities in other parts of the word that could be relevant to East Africa, and design a complementary instrument leveraging private sector stakeholder resources to the maximum extent possible to reduce the risk of geothermal development through early stage drilling. EAGP will provide logistical support, contract oversight and guidance on outreach and communication with regional stakeholders. The consultant will be responsible for consultation with key local and regional East African institutions, private sector stakeholders, Power Africa implementing teams both in Washington and field mission and; global implementers of geothermal risk mitigation initiatives to complete the objectives of this consultancy. The consultant shall outline the full methodology in the proposal, but should make use of a combination of in-person dialogue with key stakeholders and remote/desk review and communication. This consultancy includes review and assessment of existing geothermal risk mitigation mechanisms throughout the world, the unique risk factors in the East African market, the roles of existing risk mitigation mechanisms in East Africa, and designing a new, complementary mechanism to reduce risk of geothermal development into the production drilling phase. This consultancy will also require determination of how the proposed risk mitigation mechanism(s) can be funded through public or private sources and an implementation plan to outline the roles of private sector, government, multi-lateral and donor-funded institutions in launching the mechanism. impact, long-term sustainability, and a gradual transfer of risk exposure to the developer as certain project milestones are achieved. In designing the mechanism, the consultant should also provide a profile of potential projects (in MW) that could reach commercial viability within the next 2-3 years. The consultant should also quantify the ideal size of the risk mitigation facility, based upon a calculation of the number and size of projects eligible for support. In addition, the consultant should outline potential pricing and terms for eligible projects. This includes but is not limited to the development of indicative term sheets to determine project financial structures. Finally, the consultant should communicate with and identify potential funding partners among the development partners, implementing mechanisms, and potential private sector participants in the mechanism (s). The consultant’s report should also include recommendations for pilot projects through which to deploy the risk mitigation mechanism (s). The consultant should prepare a draft proposal for risk mitigation mechanism(s), including a plan for implementing and managing the mechanism (s). The suggested timeline for completion of this Phase is within 8 weeks of the launch of the consultancy. o Focus Area I, to be completed via in-person and remote consultation with existing implementers of geothermal risk mitigation facilities, should identify global best practices in geothermal risk mitigation. o Focus Area II, to be completed via in-person and remote consultation with local public and private stakeholders and managers of existing risk mitigation initiatives in East Africa, should detail any specific regional risk factors and solutions. o Focus Area III, building on the work completed under Focus Areas I and II, should be completed via consultation with potential funding partners, private sector partners, potential pilot projects, and other regional stakeholders. In close consultation with Power Africa, the consultant should facilitate discussion of the report developed under Phase I with key local and regional stakeholders, including public, industry association representatives in the US and East Africa and private sector institutions. EAGP and Power Africa will convene a stakeholder workshop in East Africa, at which the consultant will present the draft proposal and collect feedback. The planned timeline for this workshop is September/October 2016. The consultant will incorporate stakeholder feedback collected during Phase II and produce a final report, including the institutional design of a risk mitigation mechanism, potential funding partners, potential pilot projects, and a five-year implementation plan. This report is expected to be completed and delivered before the end of December 2016. 2) Design of a complementary instrument (s) leveraging private sector stakeholder resources to reduce the risk of geothermal development through early stage drilling in East Africa. 4) A proposal on how the proposed risk mitigation mechanism(s) could be structured as a “first-loss” guarantee system to incentivize lender financing of drilling programs, through either a loan guarantee scheme or a support system for drilling insurance premiums. Key considerations should include the scale of immediate impact, long-term sustainability, and a gradual transfer of risk exposure to the developer as certain project milestones are achieved. Evaluation of proposals will be conducted by a stakeholder review team on a Quality and Cost-Based Selection (QCBS) basis with a Cost weight of 30% and Quality weight of 70%. Contract management, oversight and payment will be carried out by the United States Energy Association (USEA). Proposals should be submitted by email in PDF form to Mr. Scena Nayak at snayak@usea.org. Proposals should be in PDF format and not exceed 4 separate PDF files. Proposals must be submitted no later than 5:00 PM PDT on June 16, 2016.  Technical proposal outlining the proposed work plan and methodology. This proposal should include a narrative detailing the qualifications and roles of any team members, how each objective of the consultancy will be met, an estimated timeline for the delivery of services, proposed deliverables, any necessary international travel and the location of work carried out.  CV(s) including past experience in similar projects and demonstrating a minimum of eight (8) years of professional experience in a relevant field. o Local and international travel expenses, compliant with all USAID travel regulations and the Fly America Act. The Republic of Armenia has applied for Preparation Grant in the amount of US$300,000 equivalent from the Climate Investment Funds Scaling-up Renewable Energy Program in Low Income Countries. The proposal due date is listed as August 2019. The project (Project ID: P152039) will include: (i) Preparation of Environmental and social impact assessment for the project; (ii) Preparation of resettlement policy framework for the project; (iii) Design for construction. • Drilling Supervisor: (PDF) Akiira Geothermal Limited (AGL) is looking for a seasoned Company Man/Drilling Supervisor for the production drilling period 2016 – 2017 timeframe. The Company Man will be in charge of drilling over 10 Geothermal Wells; development of the Power Plant will continue in parallel. The candidate should have at least 10 years of experience as a drilling company man/ supervisor dealing with geothermal wells with high enthalpy. Qualified candidates should contact lena.ngure@akiiraone.com by January 7. See PDF for more details. • Chief Executive Officer: (PDF) Akiira Geothermal Limited (AGL) is conducting a search for an experienced corporate executive to serve as CEO for their Geothermal Startup Company. Qualified candidates should contact hezy.ram@akiiraone.com and robert.bunyi@akiiraone.com by January 22. See PDF for more details. • Power Plant Project Manager: (PDF) Akiira Geothermal Limited (AGL) is looking for a seasoned Project Manager (PM) for the construction period 2016 – 2017 timeframe. The PM will be in charge of the construction of 2 time 35 MW single flash units plant, a steam gathering system and interconnection facilities. Development of the geothermal field will continue in parallel. Qualified candidates should contact lena.ngure@akiiraone.com by January 7. See PDF for more details.